The Benue state Governor, Mr Samuel Ortom, has directed the Ministry of Health to apply for the re-accreditation of the School of Nursing and Midwifery Makurdi. The institution’s operational license was withdrawn in 2014 and the ministry is expected to apply to the Council of Nursing and Midwifery for accreditation. Governor Ortom gave the directive while on the state wide inspection of ongoing projects ahead of preparations to mark his administration’s One Year Anniversary. 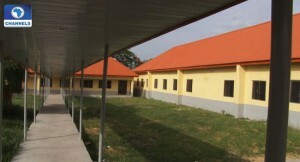 The Governor in company of his commissioners and contractors handling the reconstruction and furnishing of the School of Nursing, said the institution was ready for human capital development. Governor Ortom arrived at the School of Nursing and Midwifery in company of political appointees and the contractors handling the reconstruction and furnishing of the institution. Over 80 per cent of the structural work has been completed, while details like furnishing, landscaping and fittings were being installed ahead of the re-accreditation of the institution. He warned against further delays in seeking for approval to reopen the school. Done with the inspection at the school, the Governor and his team also visited the Achusa Journalist Village Road where the contractor was working hard to meet the set deadline. Mr Ortom also inspected the Mobile Police Barrack and Welfare Quarters Road, where he expressed joy on the level of work being done by the contractor, Hajiag Construction Limited. Both the Governor and the contractor speaks on the project specifications and delivery date. The Ortom administration is funding over 10 rural and urban road projects across the state in addition to the School of Nursing and Midwifery for the training of Nursing and other health professionals.